The final match of 1992 Cricket World Cup was played on 25th March, 1992 in Melbourne Cricket Ground in the presence of a record huge attendance of above 87000 people. Pakistan cricket team scored 249 runs. Imran Khan scored 72 and Javed Miandad scored 58 for Pakistan cricket team. Inzimam-ul-Haq scored 42 and Wasim Akram scored 33 runs. DR Pringle took 3 wickets for English cricket team. England cricket team was all out for 227 runs. NH Fairbrother scored 62. Wasim Akram and Mushtaq Ahmed of Pakistan cricket team took 3 wickets each. Aaqib Javed took 2 wickets. Imran Khan took one wicket. Pakistan cricket team won the final of 1992 Cricket world cup by 22 runs. Wasim Akram was declared man of the Match in the final match of the 1992 Cricket World Cup. 1992 Cricket World Cup was special many ways. Colors were added in the cricket world along with lights. 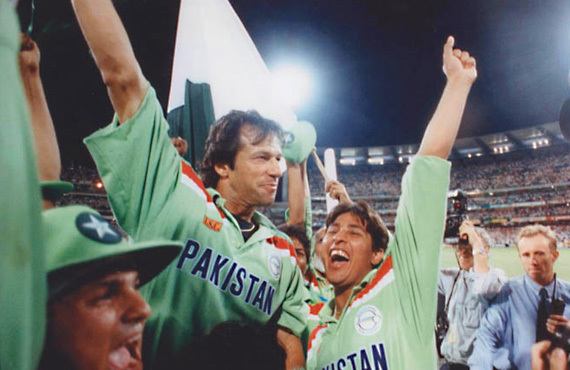 Pakistan cricket team came out as the most unpredictable contestant in the run for 1992 World Cup trophy and amazed the world with their brilliant team work under the captaincy of Imran Khan. There were many interesting incidents which took place during this match. The most important moment of this match was when Graham Gooch dropped a half chance given by Imran Khan. From a captain to another, this was the moment when the world cup final was actually decided. Imran Khan scored slowly, but proved his ability yet another time by scoring 72. Another important incident of this match was when Wasim Akram bowled Lewis on the first ball. Lewis was in good form and he was a hard hitter. If he had managed to spend time on the crease, he could have changed the results.